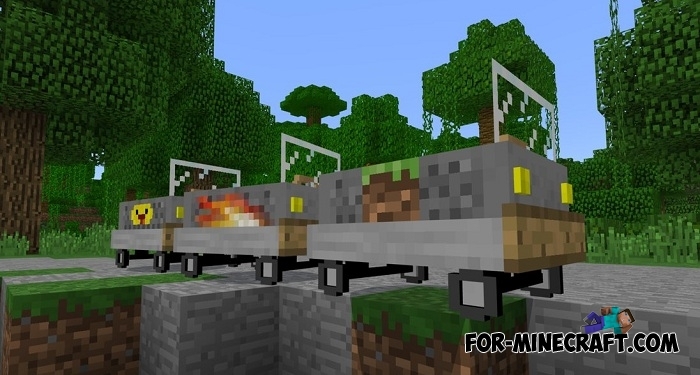 With the development of Minecraft, the addon makers do not stand still and come up with interesting ideas, even for transport addons that can not surprise. This time, Vladu11 created a very entertaining and rightfully beautiful and functional addon for Minecraft Bedrock (Pocket Edition). Support for Minecraft PE 1.2.13. It brings 6 completely different vehicles of all types. 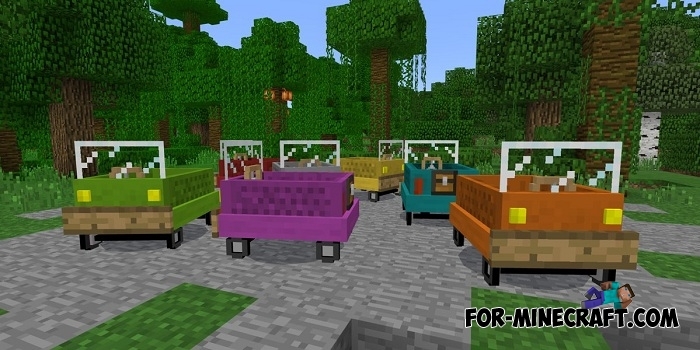 This is land, air and underwater cars (they are stylized and do not stand out from the general requirements of MCPE). This means that the pack allows everyone to swim, fly or drive a beautiful car throwing away thoughts of a long walk. You can see all the features below or in the screenshots. The most important thing is the key, do not forget to take it with you for travel. Car. 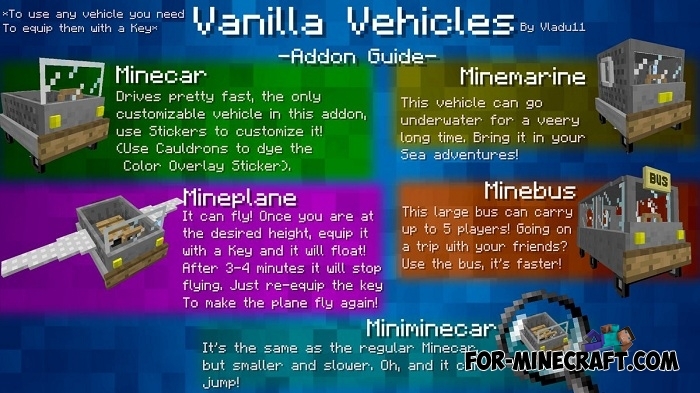 Drives pretty fast, the only customizable vehicle in the addon, use stickers to customize it. Cauldrons to dye the color overlay stickers. Marine. This vehicle can go inderwater for a very long time bring it in your sea adventures. Plane. It can fly. Once you are at the desired eight, equip it with a key and it will float. After 3-4 minutes it will stop flying, just reeuip the key to make the plane fly again. Bus. The bus can carry up to 5 players. 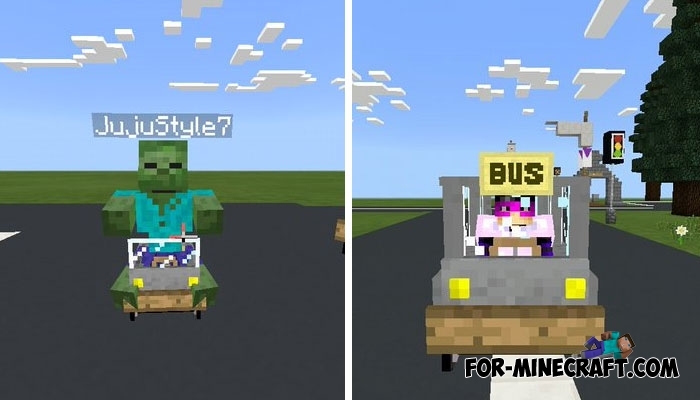 Going on a trip with your friends, use the bus, it is faster. Mini car. It's the same as the regular car, but smaller and slower. Oh, and it can jump. Bike. They are ideal for short trips to the beach for example. Another advantage of the bike is the ability to travel with a friend as there are two places (for the driver and the passenger). Mechanic. An industrious villager who will gladly sell you some items necessary for your vehicle. It is necessary to separate the bus. 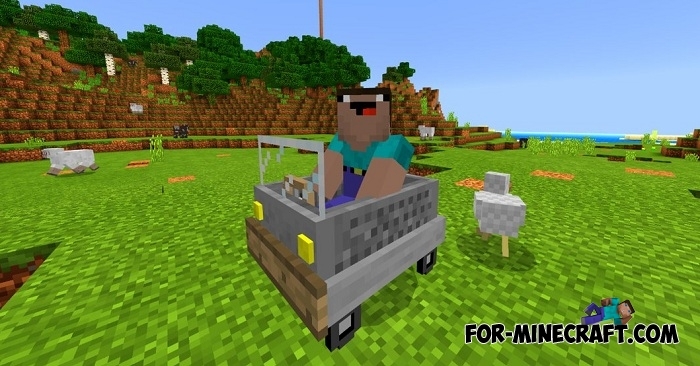 This is an indispensable vehicle if you play on a server along with other players. Look at gif and you will immediately understand how convenient and fun at the same time. How to install Vehicle Pack?